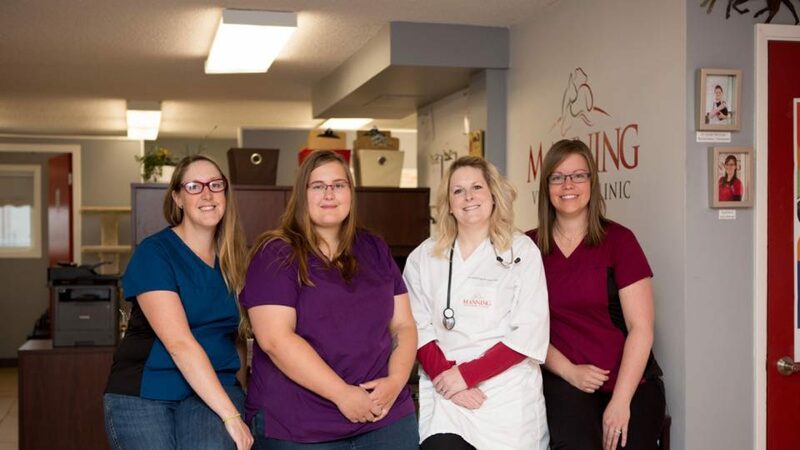 Manning Veterinary Clinic is dedicated to the health and well-being of your beloved pet. The prevention and early detection of disease gives us the opportunity to significantly improve your pets quality of life and longevity. This is especially true with periodontal (dental) disease, which is the most common health problem in pets. During the month of September it is “Dental Health Awareness Month” at Manning Veterinary Clinic. In addition to our regular dental health examinations, our team will have a number of educational materials and tips to help you with your pets home dental care program. In many instances, the changes associated with dental disease go unnoticed, pets may continue to eat and chew normally while coping with an underlying dental problem. Plaque and tartar accumulation can cause bad breath, gum disease and can increase the risk of an infection that may affect other organs in the body. 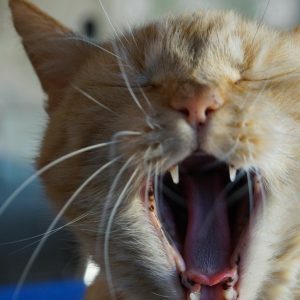 This is why it is so important that your pet has a regular dental examination. Horses often require dentistry to keep their teeth and gums healthy and ensure they can eat properly and maintain good nutritional health. Dr. McCracken and the team at Manning Veterinary Clinic utilize the latest equine dentistry technology to regularly perform teeth floating. ” I relocated to a remote community in November 2015 and posted in the local store, free to give away, was a cute little white dog called Peatree, roughly 10yrs old maybe more. When I saw her she was in pretty bad shape. After months of feeding and loving her, I brought her to the Manning Vet, to treat an issue in her eye. The vet, Jennifer, informed me that she needed dental work, stated the benefits and assured me that it would improve her quality of life. I did not have pet insurance at that time and my husband had limited employment. Jennifer recommended a few options of payment and helped me to get a grant which covered a percentage. A date was set and I brought Peatree in for her dental surgery. She spent two days there and I was amazed at how quickly she recovered. I never realized just how much Peatree’s dental issues affected her behaviour and well-being. Before her dental surgery Peatree was anxious all the time and couldn’t relax. She never engaged and always appeared nervous. I just put it down to her past bad negative experiences. As the days went by, I saw her smile more, she appeared relaxed and her anxiety levels decreased and I got to see a completely different dog before me with her own little personality. Before her dental work, I was not able to pet her head now she loves when you pet her and greets me when I come home in the evenings. Peatree has brought me so much joy and happiness. A year later, for an older dog, her health is pretty good and it has definitely increased the amount of years we have left with her.. I am extremely grateful to Jennifer and her team at Manning Vet for the care they provided Peatree. I would recommend this service for sure.” – Caroline G.
What’s wrong with this picture? 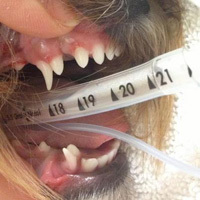 Retained baby teeth are a really common problem, especially for small breed dogs. It is really important to have these teeth removed, otherwise the baby teeth can damage the adult teeth and create significant periodontal disease.